This was not my planned side dish for our Chicken Curry, but I am happy to report that it was an excellent alternative. Originally, I thought that we would have cauliflower with our curry, but no dice. Cabbage it is. Cabbage may be better anyway, although I never would have guessed that growing up. My family didn’t eat much cabbage. It is one of those vegetables that must be prepared correctly for it to really knock your socks off. Cauliflower is kind of the same way in that it needs to be prepared well for me to get excited about it. Perhaps I should get my act together and try the Indian Spiced Cauliflower sooner rather than later. Chris, do you believe that I like the Indian cookbook that you so kindly brought home for me now? I hope so, because I’m obviously going to be trying to buy an African cookbook. I wonder if finding the ingredients to cook things from an African cookbook will be as difficult as using my Peruvian one? I am leaning towards as, if not more difficult. Although we live in a small town, we are really lucky to have two fantastic Asian ethnic grocery stores, a Japanese one and a pan-Asian store. I have had pretty good luck with them having most Asian ingredients that I am looking for, but the Peruvian ingredients are either not available here or I am running into many lost in translation situations with the book. Bone-in guinea pig anyone? Speaking of our Asian grocery stores, I made another attempt at Char Sui Baos recently, but they weren’t quite right. I need to get some five spice powder. I am fairly sure that I can get it here, I just haven’t made my way to the correct store yet. Until then…let’s talk cabbage. Adapted from 50 Great Curries of India by Camellia Panjabi. Saute onion, ginger, and chili pepper in a heavy skillet with olive oil spray for 20-25 mintues or until the onion begins to turn brown. 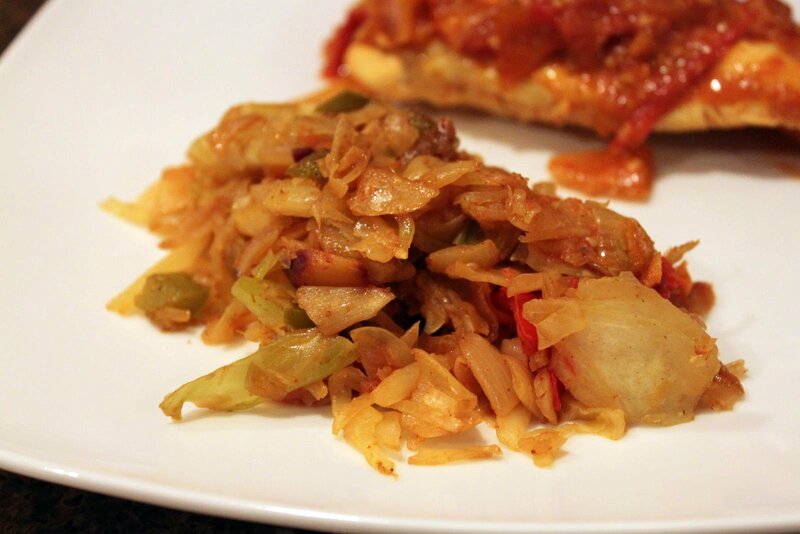 Add cabbage and remaining spices, combining well, then cook for an additional 10 mintues. Next combine tomatoes with the cabbage mixture and continue cooking until the tomatoes have softened. 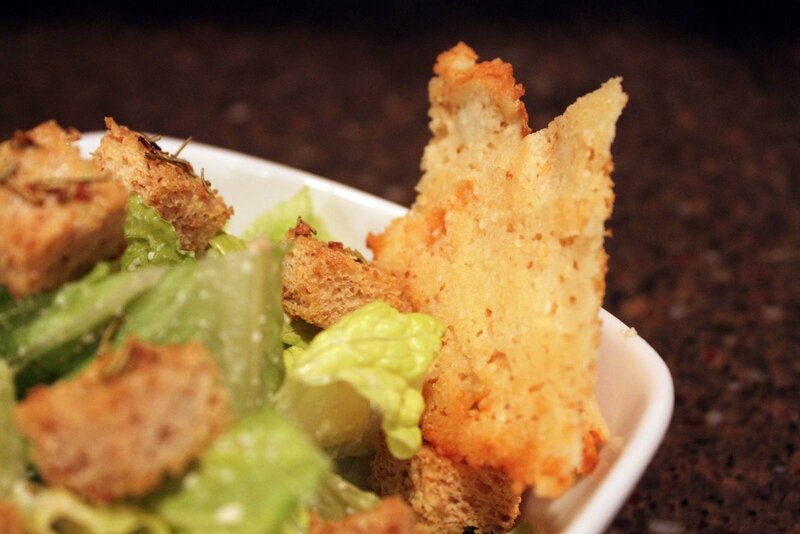 When I decided to do a Caesar dressing post, I envisioned a beautiful Caesar salad with shaved Parmesan and perfectly browned home-made crutons. I did make some pretty nice looking crutons, but I failed miserably with the shaved Parmesan. I forgot to buy “real” Parmesan at the grocery store, so I was relegated to dressing my salad with the bottled kind. 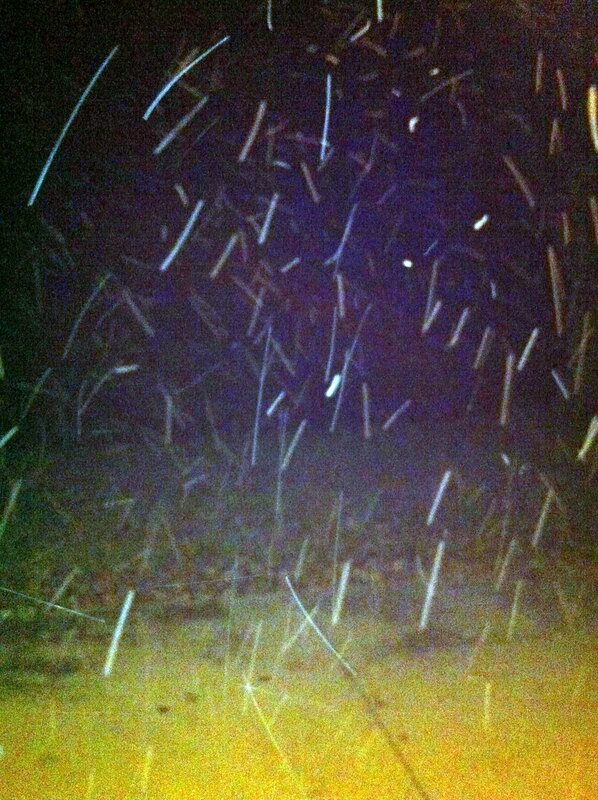 It wasn’t the end of the world, but it certainly didn’t have the same effect in pictures as the shaved variety. As a means to compensate for my lack of shaved cheese, I decided to fry up some of the “fake” stuff into Frico Crisps. Melt butter in a skillet over a medium heat. Sprinkle Parmesan in the skillet and swirl the skillet around to coat the bottom of the skillet. Cook Parmesan for 3 minutes or until the edges begin to brown. Carefully flip the crisp and cook for not quite a minute. Place crisp on a paper towel on a flat surface to cool. When cooled, cut into desired shapes. We are still on our grocery shopping hiatus, I did one of those “type a whole bunch of random ingredients into Google and see what recipes pop up”. That can yield amazing results…or be a complete disaster. It was risky-ish business for this meal because it was for one of our anniversary dinners. 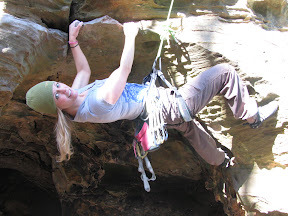 The pressure was lessened some though because we have two anniversaries. Yep, we got married twice. Not that exciting of a story. It sounds mysterious though. Anyway, we will get to repeat this ritual again next week. Hopefully after grocery shopping. Fortunately the butternut squash was a winner! In fact, we both thought that it was quite possibly the best butternut squash dish that we had ever tried. I wasn’t sure how I would feel about cilantro and crystallized ginger together, but it turns out that they are fabulous together. They made for a very fresh tasting fall dish. Spritz the squash with olive oil spray, then in a large bowl, toss the squash with the coriander, salt, and pepper. On each of 2 large baking sheets, arrange the squash in a single layer and bake, turning occasionally, until tender and golden-brown, about 30 minutes. 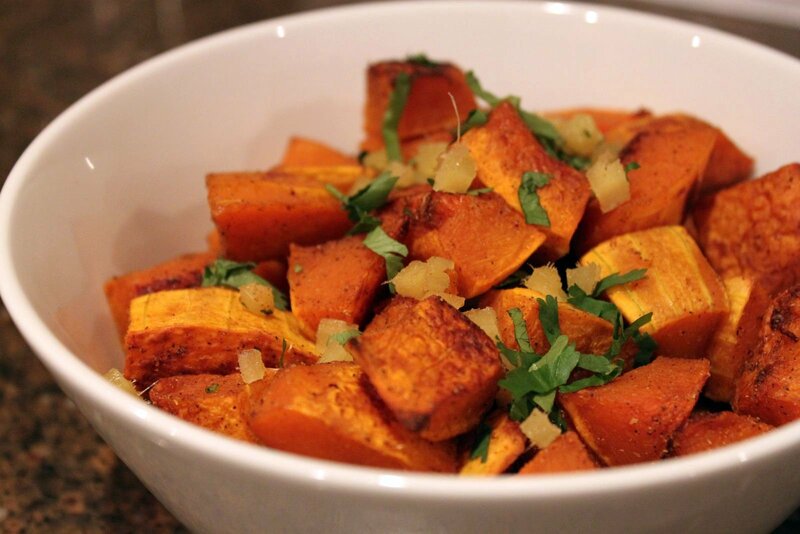 Transfer the squash to a serving bowl and toss with the crystallized ginger and cilantro. I used the last of my CSA zucchini and squash in this dish. On one hand, I’m bummed out that the CSA is over for the year. On the other hand, I’m relieved about being able to shop for and plan for meals more effectively. Our CSA gave us the option of Wednesday or Saturday pickups, but it seems like neither one is a good option for us. We picked Wednesday because we didn’t want to miss Saturday pickups if we were out of town for the weekend. Wednesday didn’t really work out either because of our Saturday meal planning/grocery shopping cycle. I really would have preferred a Friday pick-up. Last weekend my brother came to visit so we haven’t done any grocery shopping at all in over a week. (Sorry G, we should have bought food before you arrived at least!) Needless to say, we have been having some interesting meals lately. 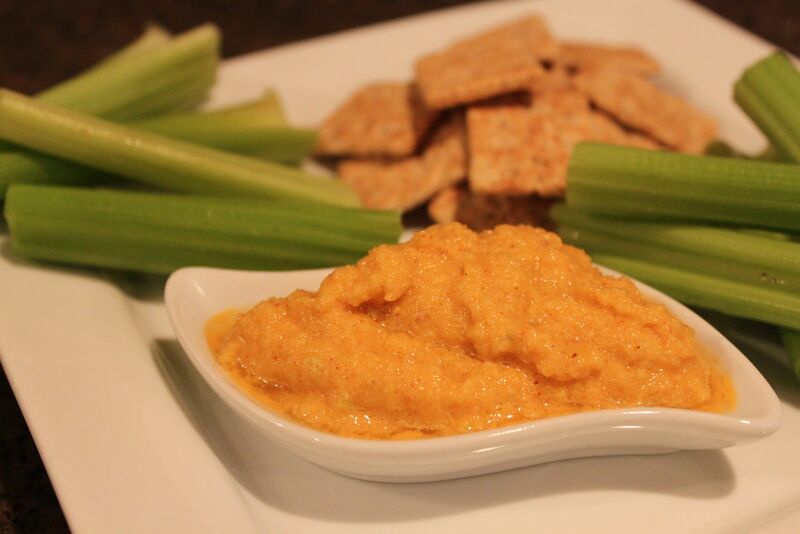 This “squash hummus” was one of the most tasty creations stemming from our grocery shopping laziness. Place all ingredients into a food processor and blend until smooth or to desired consistency. 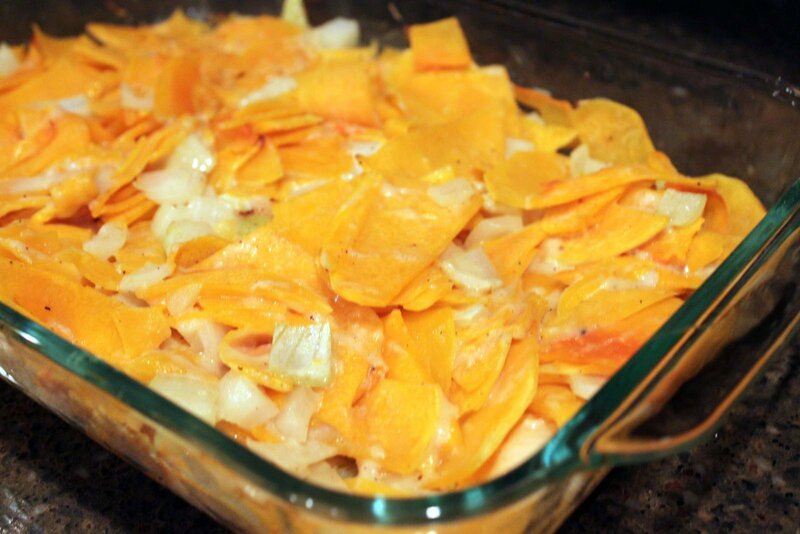 Serve with veggies, crackers, or pita chips. After letting these green beans sit in my refrigerator for far longer than should be acceptable, I decided to give in and bread them. I seem to be on a faux frying kick lately. 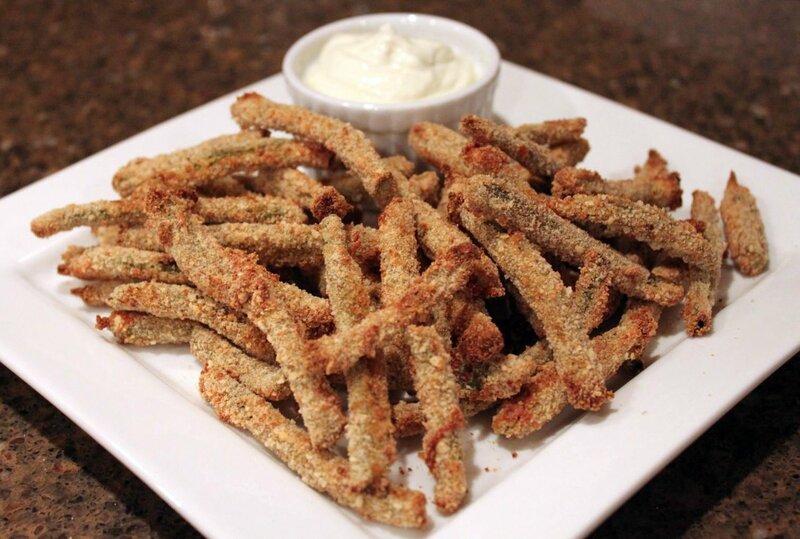 We had awesome fried green beans a few weekends ago when we went out for lunch downtown. They were supposed to be served with a curried mayonnaise dipping sauce, but the restaurant was all out of it and gave us ketchup instead. On one hand, I was bummed. On the other hand, I knew that I didn’t need to be dipping fried food into mayo. I briefly considered making curried mayo for these, but gave in to better judgement and chose a sour cream based wasabi dipping sauce. Chris and I both really liked the wasabi sauce and liked it even better when double dipped in ketchup. Tastes like cocktail sauce, huh? Mmmm. Maybe next time we’ll do a shrimp and green bean dinner. That totally sounds like an odd combo, but we’re not above having odd dinners at Duke’s House and it would be tasty, trust me! Green Beans adapted from Jordie Porgie. Wasabi Dipping Sauce adapted from My Recipes. Wash and trim green beans and cut into halves and thoroughly dry them. In a medium bowl, combine breadcrumbs, salt, pepper, garlic powder, onion powder, and cayenne. Whisk eggs to break them up completely. Keeping one hand dry and one hand wet, dip a green bean in the eggs, lift it out and shake off any excess egg, put green bean in bread crumbs mixture and coat completely, lift out and shake off any excess bread crumbs, then transfer green bean to prepared baking sheet. Bake for about 30 minutes, turning once, until browned, crispy, and tender to the bite. Adjust wasabi/sour cream to taste. 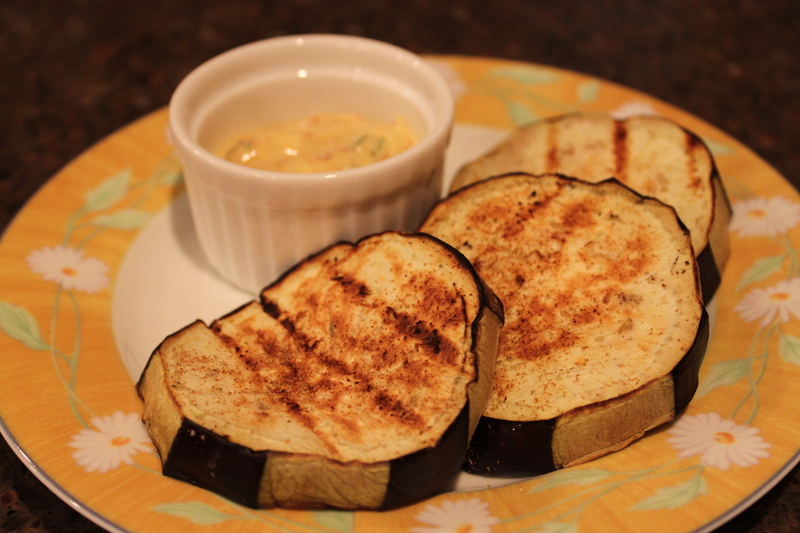 I really like grilled eggplant lately. Lucky for me, I keep getting eggplants in my CSA box. I don’t think that I have ever grilled one until this summer. I had tried making a variety of baked eggplant dishes, but I was never able to get the texture that I desired in the oven. My grilled eggplant seems to be a lot more firm. As an added bonus, it cooks much more quickly as well. I think it is wearing on me a lot more in the past few days because this week I dropped out of the two races that I had left on my schedule this fall. That pretty much means that I will have to wait until March to race again. Very sad. The good news is that the Indianapolis Monumental Marathon race coordinator allowed me to transfer my entry to next year. I’m really thankful for that because at least I’m not out the entry fee and the race. On the upside, my shoes will probably last for at least a month or two longer than I had originally anticipated. Slice eggplant crosswise into 1/2″ thick slices. Place eggplant slices on a paper towel, lightly salt both sides of the eggplant and let it rest on the paper towel for 10-15 minutes until some of the juice has drained from the eggplant. Mix the yogurt sauce ingredients in medium bowl. Heat a grill to a medium-high heat. Lightly brush both sides of the eggplant with sesame oil. Sprinkle the eggplant with coriander, salt, and pepper. Serve the eggplant with yogurt-mint sauce.